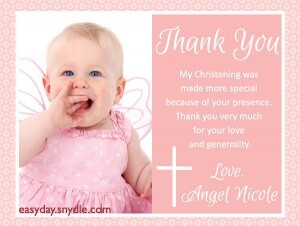 Here are thank you text messages for baptism and christening thank you notes for you. Baptism is very important in a baby’s life. It is when he or she is presented before God and before the Church. The baby is purified with water to wash away the sins inherited from Adam and Eve, so that she may begin his or her walk with Christ. The parents of the child have made a choice in his or her behalf to follow Christ and his teachings. They also made a vow to bring up their child in a way that pleases God. They made a vow to teach him or her teachings and commandments of our Lord. The parents have also chosen people who will help rear their child to please God. They shall help mold the child to understand what it means to be a Christian. Being called to be a godfather or godmother means that you have the responsibility to not only take care of the child in hard times but also to be an example in faith so that the child will never stumble in his or her walk with Christ. Thank you for being with me and my family in the beginning my journey with God. Thank you for the wonderful gift. My Christening was made even more meaningful because of you. Thank you for being there and for the gift. Your presence made my christening even more special. Thank you very much for coming. God has blessed me with people like you. Thank you for the gift. Thank you for witnessing the christening of our child. Your presence, love and support has made this day even more special. Of all the blessings God has given me, you’re one of the best! Thank you for witnessing my Christening. Thank you for welcoming me into God’s family. God bless you. Baptism is one of the most important events of a child’s life. We are so glad that you were there to witness it. Thank you for the gift. My Baptism was made more special because of your presence. Thank you very much for your love and generosity. We appreciate the love and support you gave us during our child’s baptism. God bless you. Your presence and love were felt and they made our child’s christening even more special. Thank you very much! Our child’s christening would not be the same without you! Thank you very much for coming. Our child’s christening was filled with love and joy. Thank you for your love and support! Your presence and love was a gift sent from above. Thank you for witnessing my christening! This Thank You Note is not enough to express our gratitude for your love, support and generosity in this very special day. Thank you very much for celebrating our child’s christening with us. 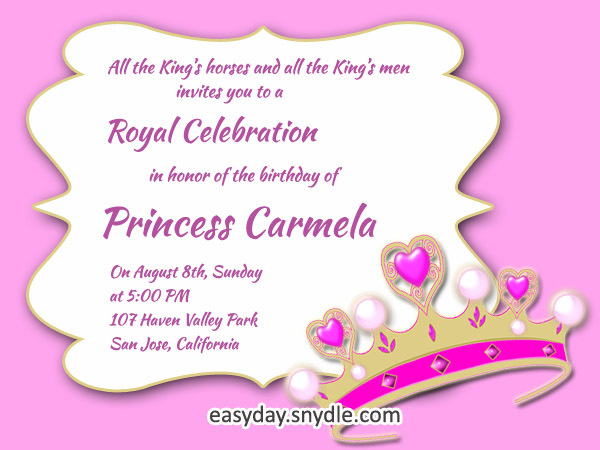 We appreciate your love and support as we dedicate our child to God. The occasion was made more special because of you. Thank you very much. God bless you. On this day, we dedicate our child to God and His Ministry. We thank you for being there to witness this very special day. God be with you. You have surrounded our little angel with your love during her christening. Thank you very much for celebrating the gift of God’s love with us. God’s love was felt in your presence. 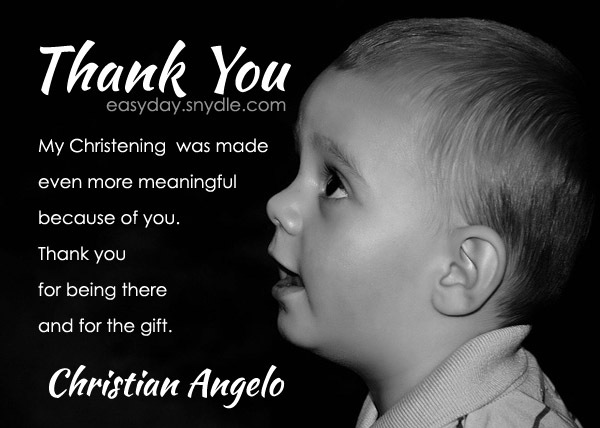 Thank you for celebrating our child’s christening with us. It wouldn’t be the same without people like you.